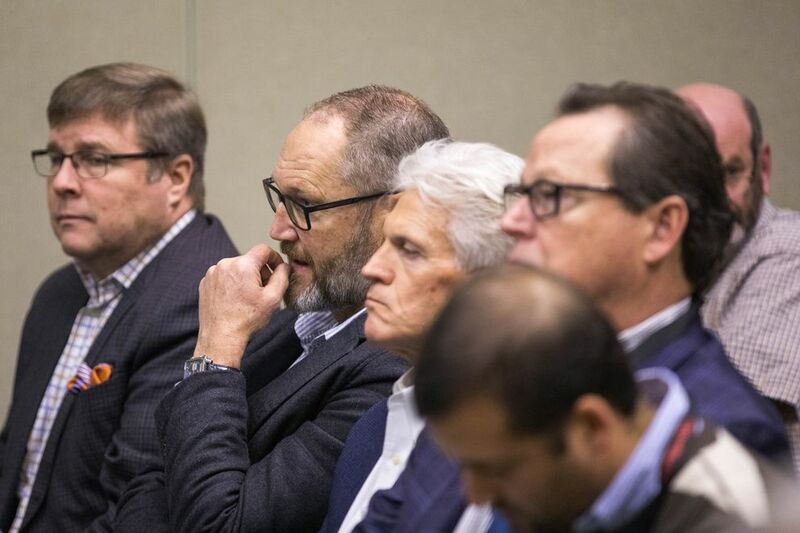 Large new projects are on tap as the industry races to find oil in a little-studied rock formation that’s generating renewed interest in Alaska’s oil-rich region. 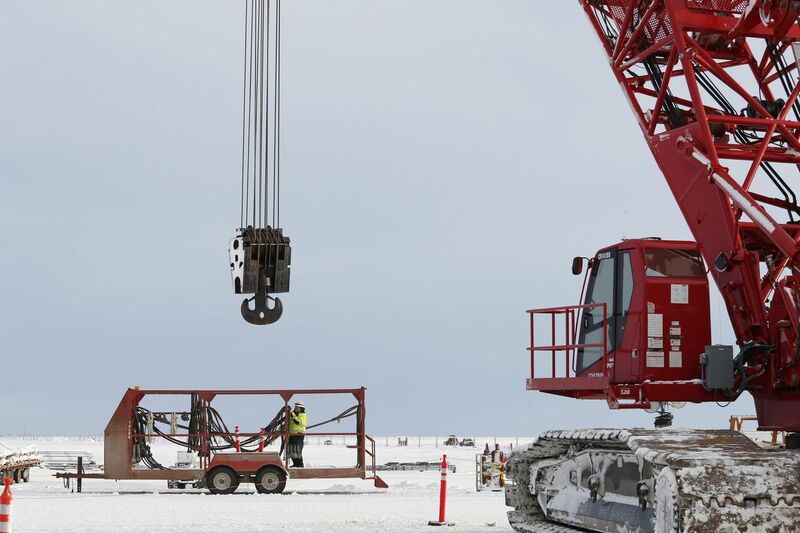 The North Slope oil patch is generating a surge of interest not seen in more than a decade, as investors eye new opportunities and companies plan billions of dollars in new projects, observers say. Near-term, the upcoming winter exploration season is expected to be the busiest in five years, with ConocoPhillips leading the way, said Chantal Walsh, director of Alaska’s Oil and Gas Division. Long-term, oil companies are looking to complete projects by 2024 that could cost more than $10 billion. They could produce thousands of jobs, if developed. 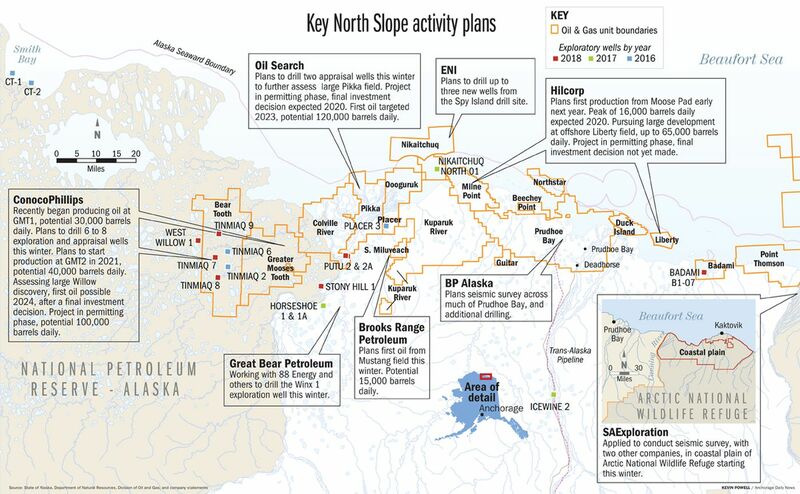 Helping spark “The New Alaskan Oil Rush,” in the words of one trade publication, are two giant discoveries on the western side of North Slope development. Officials say there’s potential for more discoveries in the region where those were made, in a long-overlooked geological formation called the Nanushuk. People seeking first-time oil field work can get it, said William Bieber, director of a mining and petroleum training program at University of Alaska Fairbanks. This year, he launched the state’s only program providing hands-on training for roustabouts, workers who haul supplies and do other tasks at drilling sites. After two weeks at training camp, they can earn about $70,000 annually for two-week rotations. The second class of 20 is now graduating, Bieber said Wednesday. “Drilling companies came to me and said they need Alaska folks working,” he said. “There was so much demand for it we created the program." * ConocoPhillips' Willow discovery, announced in 2017, a $5 billion project with potential for 100,000 barrels of oil daily. * The Pikka discovery overseen by Oil Search, among the biggest onshore discoveries in the U.S. in decades. Announced in 2013, it’s a $5 billion project, with potential for at least 120,000 barrels daily. * Hilcorp’s Liberty prospect, discovered in 1997 but never developed. The $1.5 billion project could produce 65,000 barrels daily. Companies must still make final investment decisions for those big projects. But other smaller projects have that certainty, such as ConocoPhillips' GMT2 field, set to begin producing in 2021 at a cost of more than $1 billion, adding up to 40,000 barrels daily. The two big discoveries in recent years, plus new opportunities on federal land including the Arctic National Wildlife Refuge that Congress opened for development in December, have caught the attention of investors worldwide, said Kareemah Mohamed, with global market research firm IHS Markit. She authored a report this summer calling the Slope a “super basin” poised for a turnaround, after decades of declining production as behemoth Prudhoe Bay and other fields have aged. Mohamed has fielded questions from banks, private equity firms and others looking for investments on the Slope. “There is a lot of interest,” Mohamed told a reporter. It’s possible the new discoveries will never be developed, said David Houseknecht, head of the U.S. Geological Energy Resources Program for Alaska. But the outlook is promising, he said. Companies are also calling Houseknecht to learn more. It’s the most interest he’s seen in Alaska since the late 1990s, as that decade’s hot discovery, the Alpine field, advanced toward production. At the time, hopes for additional new finds often fizzled, as exploration wells came up short. For now, companies are charging ahead. This winter, BP plans a large seismic survey of Prudhoe Bay, looking for detailed views of remaining opportunities. ConocoPhillips Alaska will dominate industry exploration this winter, planning six to eight exploration and appraisal wells. It will be the company’s largest exploration season in 16 years, rivaling last year’s big, successful season, said Joe Marushack, president of ConocoPhillips Alaska. ConocoPhillips will primarily target the Nanushuk, the geological formation where the recent discoveries were made, he said. He said other reasons for renewed interest in the Slope include stable Alaska taxes and efficient, “game-changing” drilling technology. The overall trend of higher oil prices, despite a recent pullback, is also key. 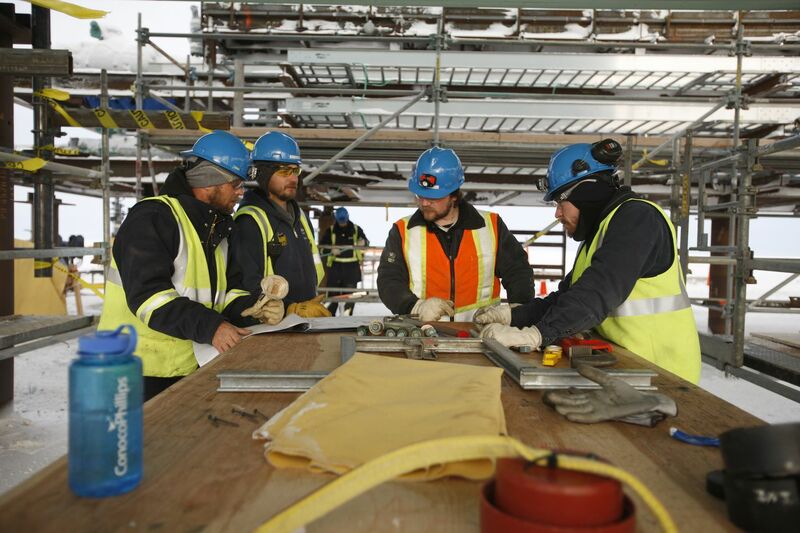 Projects on tap industry-wide could result in $13 billion in spending over a decade, he said. “There’s a lot of excitement," Marushack said. U.S. Sen. Dan Sullivan, instrumental to the legislation that opened ANWR’s coastal plain to development, said the Trump administration’s drive to develop federal lands has helped Alaska. It contrasts with the Obama era, when projects were delayed and acreage taken off the table, he said. 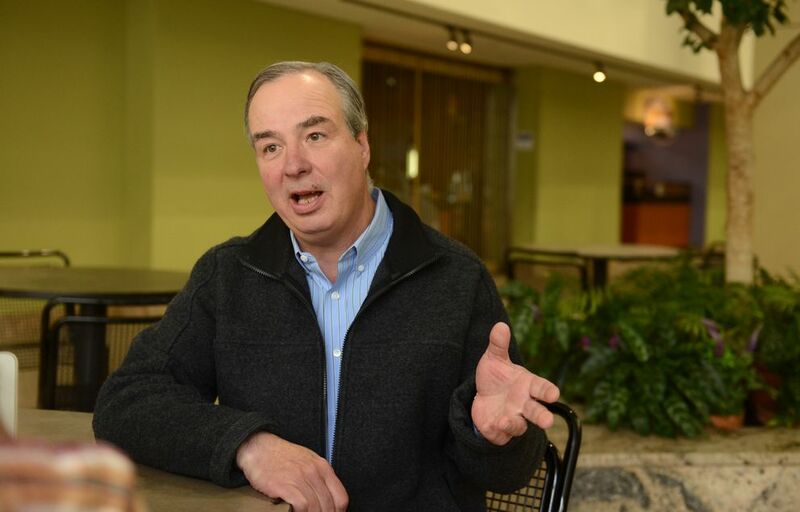 “Now we have a federal government that wants to help,” Sullivan said. Keiran Wullf, head of Oil Search Alaska, said the Nanushuk formation is critical to the growing interest. “All the industry is now very, very focused on this play," he said. Exploration in the formation is in its “infancy,” he said. He said the Nanushuk isn’t expected to be another Prudhoe Bay, where 13 billion barrels have been produced. “We would love it to be the next Kuparuk,” he said, referring to Alaska’s second-largest field with more than 2.5 billion barrels produced. Oil Search will drill two appraisal wells this winter to better assess the Pikka discovery in the Nanushuk. Also this winter, a consortium that includes Australian firm 88 Energy plans to conduct exploration drilling in the formation, on acreage south of Pikka. Some of the big projects on tap, if developed, would produce oil from federal or Native-owned lands. The state receives a smaller royalty share from that oil, versus oil from state lands, said Sen. Bert Stedman, R-Sitka, a member of the National Petroleum Council that advises the Energy Secretary on policy. The Legislative audit committee Stedman chairs has hired consultants to analyze the costs and benefits to Alaska of oil from non-state lands. Additional production will help Alaska’s economy, including from federal lands such as ANWR, he said. SAExploration and other companies have applied to launch an unprecedented seismic exploration in the refuge this winter, possibly leading to more discoveries. “That could be a boon for the state," Stedman said.